Standard UK and European electric 220v to 240v. Ideal for replacing your old lighting sockets. Product length = 275mm. Mounting plate = 85mm. 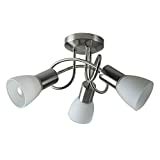 Adjustable direction swivels so you can fully adjust the lights. The 4 and 6 bulb version also have folding adjustable bars but can also be straight. 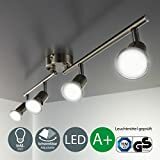 6 LED GU10 Bulbs Required (not included) - Super Energy Saving. Full Assembly Required with time and effort. 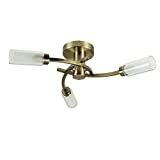 Versatile ceiling lighting fixture,Can be applied in commercial and exhibition locations like restaurants and galleries. 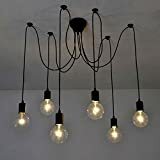 Good choice for kitchen, dining room, bar, office, schools to show vintage industrial style. 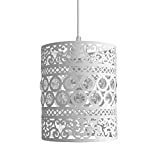 This Pendant Light Shade works well with any incandescent or LED bulbs with standard E27 base. 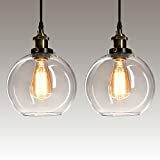 Compatible wattage of the bulbs is 40 watts. 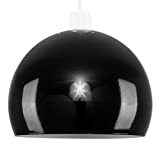 Warm bright: you can fix the ceiling light in a room of about 15m² to 20m². 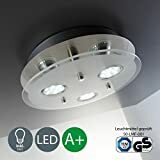 The high-quality LEDs do not require a warm-up time. 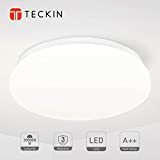 Eye Protection Led Ceiling Lights:The lamp provides an anti-glare lampshade with a colour temperature of 3000 Kelvin.You don't need to worry about your eye after you turn it on for a long time. 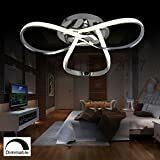 A UNIQUE CEILING LIGHT. 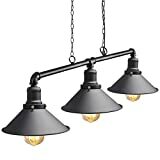 This ceiling light made from high-quality rustic style iron has been skillfully engineered to look as authentic as possible and enables you to create an amazingly rich ambiance. 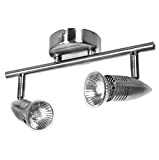 The product features a one of kind industrial waterpipe fitting with a 5 bulb design and an E27 socket. 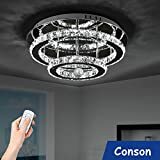 It measures 80cm in length, 8cm in height and weighs 2.7kg so please check before installing to see it fits on the ceiling perfectly. MULTIPURPOSE DESIGN: Our one of its kind chandelier features a distinctive vintage water pipe design that can create a wide range of highly emotional atmospheres and styles including Modern, Retro, Industrial, Antique, Rustic and Steampunk so you can be sure that your customers, friends or family will have an experience they will never forget. ENDLESS VERSATILITY. We've created a pendant light that beautifully blends into many different environments. 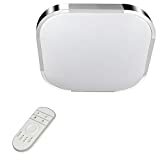 It can be used at home in the kitchen, living room, bedroom and other living areas. 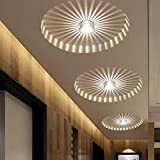 It's also perfect for professional use where you want to create a special ambient such as restaurants, cafés, bars, clubs, offices, galleries, showrooms, and aisles. It will create a lasting impression and complete your surroundings wherever you decide to use it. EASY INSTALLATION. 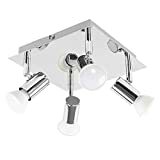 Unlike other hanging lamps which are hard and sometimes even dangerous to install, our hanging lamp features a patented mounting kit which means that your installation is going to be quick, safe and easy. 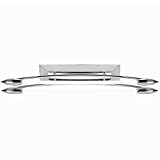 With its adjustable cord, you'll be able to quickly change the drop from the ceiling holder. An easy to understand user's manual is included with the package. MONEY BACK GUARANTEE! Does this come with a money back guarantee? YES! Your purchase comes with a no-risk, no-nonsense 100% Money Back Guarantee. Either you're thrilled with the product or we don't want your money! Customer satisfaction is our number one priority. 【APPLICATION AREA】 : 4-6㎡(Bathroom, Storage room, Balcony, Garage, Loft) JUST NOTICED that Don't installed the light vertically towards the shower leader. 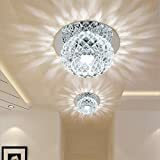 【DIMENSION】 : 30cm*30cm*7.2cm:The LED is covered with an arched clear plastic lens, Which ensures a homogeneous and glare-free light.We are the only brand has this function. 【THE ITEM IS UPDATED VERSION】: Sealed for dust-proof; Tasteful package with five languages user mannual. 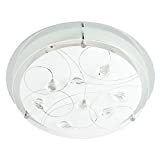 LED Ceiling Light Application Ceiling Type: without suspended ceiling, integrated ceiling. 2. Mounting surface material: gypsum, wood, PC, concrete. 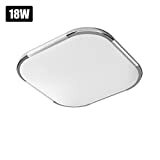 Note: It is not recommended to install in improper drilling, easy to conductive, brittle mounting surface such as: metal, glass etc. 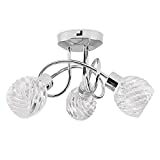 An elegant and modern ceiling light that can be integrated into any living space, office, kitchen, bedroom or living room setting, made from metal and partially frosted glass with a stainless steel look. 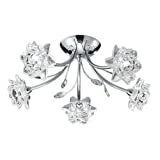 Four LED bulbs, with GU10 fittings, are supplied. Each outputs 250 lumens, offering ample light, and will delight for a long time to come thanks to an average lifespan of 20,000 each. Premium IP65 4ftoot LED batten, superb indoor and outdoor LED linear light. 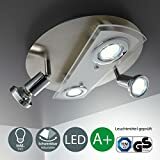 Excellent for exterior lighting, expertly made for garages, gardens, carparks, walkways, storage rooms, patios, feature-lighting, security lighting, warehouses, factories, site projects, porch lighting, bathrooms. Brilliant for both commercial and residential use. 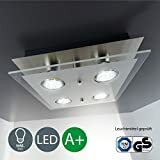 The most efficient LED Tri-Proof Light available today. 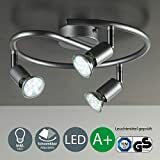 Great substitute for Fluorescent/Halogen/Incandescent fittings and can directly replace with standard fluorescent fittings with 80% less Energy Consumption. Exceptionally long product life, reduced maintenance and disposal costs. 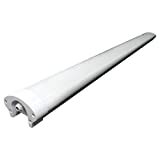 These superior IP65 4 foot led batten lights have been professionally designed to produce high quality light whilst maximise lifetime and efficiency, High colour rendering (CRI > 80), evenly dispersion and diffusion of light and clear light output, wide beam angle with super bright, shadow-free coverage. 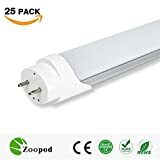 Excellent LED tube fitting with strong heat resistant ability; Very Bright, Shatter Resistant, Shock and Vibration Resistant, Dust Proof, Weatherproof and IP65 Water Resistant, less heat radiation, no mercury or harmful chemicals, fully silent, no flicker, reach full brightness instantly. NEW CE and ROHS Authenticated, Easy to install, safety warrantied and tested to the highest Standard (ISO), each LED IP65 outdoor light has 5 Years Guarantee. 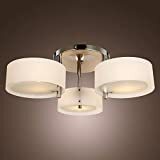 Modern Non Electric pendant light shade with polished chrome metal frame. Dimensions: Dia250mm x 255mm Height. Maximum bulb wattage: with shade reducer ring fit for E27/E14 60W GLS, LED / 12W energy saver. 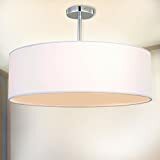 Ceiling rose and flex is not included - pendant shade only. High Quality The product consists of a partly modernised glass with a clear edge. 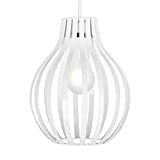 It is designed in a chrome frosted look with an opal glass diffuser. The lamps were TÜV-tested. 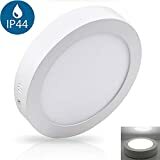 Pleasant lighting The lamp with four LEDs provides a strong lighting performance with a colour temperature of 3000 Kelvin. The 3 watt and 250 lumen lights are also included. Modern and versatile The light is made of metallic-glass and creates a uniform light surface with a comfortable luminance level. The warm-white colour generates a cosy ambience. Eco-friendly The modern LED technology provides energy efficiency and low power consumption. The lights rarely need to be replaced because of their durability of 20000 hours. Smart Finest design and highest German quality: The replaceable LED-lights are the most power-saving solution for illumination. They reduce ambient heat and maintenance costs. Safety Certification: CE RoHS. World-class ODM foundry products,Silver-toned ABS plastic construction,Impact resistance. 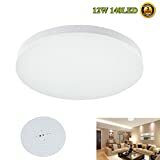 Sufficient Brightness: 5000K, true daylight light--80+ CRI--Size: D285*H65mm--Input Voltage: AC85-265V,950~1100LM--The irradiation: area225sq.ft-322sq.ft. Energy-Saving and Long Service Life: Professional, Bright,Eco-friendly.The minimum service life is up to 50000 hours. Generally used for more than 10 years. Easy to Install: Detailed installation instructions in your package(LED AC adaptor included). Sound After-Sale Service:3 year warranty, 1 year free replacement within warranty,30 days return without reasons.  Compatible Bulbs Type: E14 X 3, Max 60 Watts (Bulbs not included). Bulb Holders is flexible. Compatible Voltage:220V~240V. 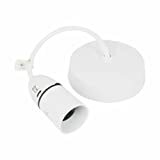 Compatible with many kind bulbs: Dimmable Blubs, Energy saving bulbs, Led Buldb,Halogen Bulbs etc. 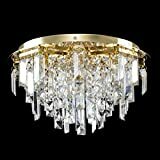  Material:Glass & Crystal & Chrome.Absolutely glass crystal made. 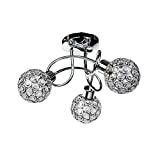 Exquisite shining crystal droplets. 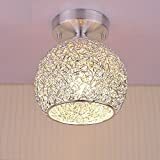 Will be sparkling in your room.The really item will not let you dispoint. The really one is more nice than pics. 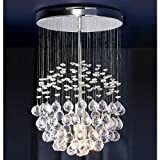  High-quality Luxurious Beautiful rainfall design, sparkles from every angle, Gorgeous chandelier!!! 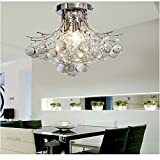 This is a good value for money and made my living room luxury. 100% worth the price and good quality.  Requires self-assembly. Easy to install. 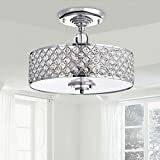 - CHARMING VINTAGE DESIGN: The quaint design of the Fab ceiling light pendant fixture comprises of a beautiful clear glass shade attached to a vintage-style metallic frame that comes in modern chrome or classic brushed nickel. 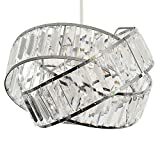 - COMPATIBLE WITH EXISTING HOME DECOR: Beautiful vintage craftsmanship enables the glass shade lighting fixture to blend in seamlessly with the current décor of your home, be it in the kitchen, the loft, the dining room or the study area as well. - EXPERTLY CRAFTED: Fab-Light lampshades are constructed with elegance in mind but are also made to last a lifetime. 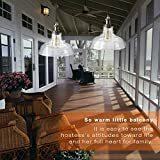 The durably built lighting fixtures offer a touch of elegance and sophistication and provide warm, ambient lighting that sets a calm, and also a peaceful atmosphere. 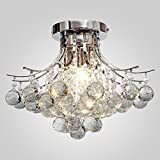 - POCKET-FRIENDLY: Give your home a premium touch of sophistication without hurting your pockets with the Fab lighting fixtures. 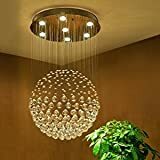 They are the perfect home décor piece for you if you're thinking of remodeling or redecorating a room or your entire home as well. Click "Add to Cart" now! AN EXCLUSIVE MIXTURE OF MODERN AND RETRO DESIGN LANGUAGE. We've worked hard to combine the contemporary and retro styling and we're proud to say it really shines through this light. 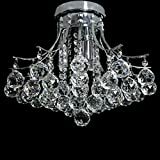 It's been skillfully engineered from a highly transparent glass crystal with a gorgeous vintage metal lamp holder to create an amazingly rich ambiance. With its unique cone-shaped design, it's guaranteed to turn heads and receive compliments. 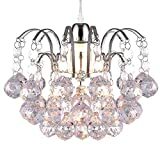 A perfect solution for those who want to own a truly unique light fixture. PERFECT FITTING FOR ANY SETTING. Our pendant light beautifully blends into many different environments. 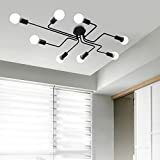 It can be used at home in the kitchen, living room, bedroom and other living areas. It's also perfect for professional use where you want to create a special ambient such as restaurants, cafés, bars, clubs, galleries, showrooms, aisles, and offices. It will create a lasting impression and complete your surroundings wherever you decide to use it. CREATE UNIQUE AND EXCITING STYLES. 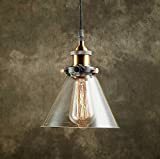 This retro light features a distinctive cone-shaped design with a stunning transparent glass crystal shade that can depending on positioning and light bulb choice create a wide range of highly emotional atmospheres and styles including Modern, Retro, Industrial, Rustic, Vintage, Steampunk and many more. You can be sure that your customers, friends or family will have an experience they will never forget. SUPER EASY INSTALLATION. 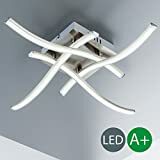 Unlike other hanging lamps that can be hard or sometimes even dangerous to install, our hanging lamp features a patented mounting kit and an easy to understand user's manual which means that your installation is going to be quick, safe and easy. 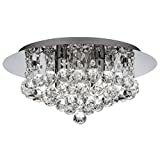 This light fixture measures 19cm in diameter, 23cm in height and weighs 1.0kg so check before installing to see if it fits on the ceiling perfectly. 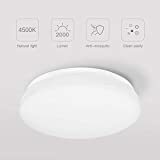 Pleasant lighting The lamp with three LEDs provides a strong lighting performance with a colour temperature of 3000 Kelvin. The 3 watt and 250 lumen lights are also included.